Now that the winter months are upon us, we are making preparations in South Florida for our annual visitors, the blacktip sharks (Carcharhinus limbatus). With these magnificent marine megafauna aggregating just off the coastline, our lab utilizes underwater cameras to monitor their numbers, behaviors, and interactions with other individuals and their environment. The ability to see underwater is not a novel concept, but our lab has developed a cheap technique by which we can visualize underneath the ocean’s surface in our nearshore environment, without having to physically be there. 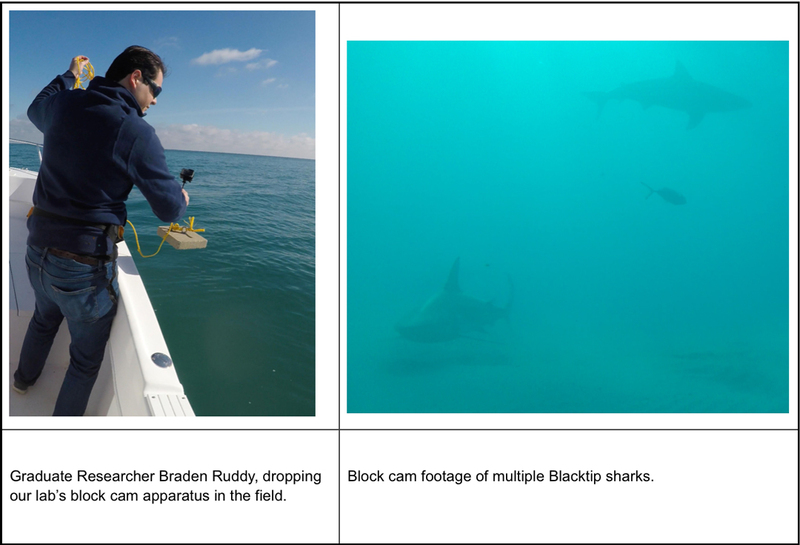 Filming of blacktip sharks swimming in the wild utilizing our block cam apparatus. Placing consumer grade waterproof video cameras with 4K video on blocks of cement, we can drop the apparatus at 4 distinct depth measurements, keeping the orientation and location of the camera consistent upon every drop. This can easily be done on the way out to drone fly or before our lab’s tagging effort. By allowing these cameras to sit for the span of their battery life, which lasts about 3 hours, we are able to easily see what is going on underneath the ocean’s surface at varying depths while no one is looking! Retrieval of the cameras requires minimal effort due to a signature buoy that’s attached to the cement block, and footage is then taken back to the lab for analysis. Video footage is meticulously viewed, with graduate and undergraduate researchers making explicit documentation of all species, behaviours, and terrain seen on camera. Our team is able to gather important information about species diversity during different parts of the year, and is able to quantify depth preference. Unique behaviours can be viewed from our underwater perspective. A variety of species can be observed and documented utilizing this methodology. A variety of Predator-prey interactions, as well as individualized behaviors and identification can be documented and quantified through this technique. Also, geographic terrain and other underwater structures can clue us in on where individual and schools of blacktip sharks are choosing to aggregate. This data can aid in our tagging and drone efforts by providing blacktip shark depth preferences and density data, and can act as an underwater third eye for those breathtaking moments we aren’t there to see. Future work with these block cams in differing orientations will allow us to quantify shark swimming in 3 dimensions, and can provide information about how these sharks are spatially arranging with respect to each other and their environment, helping us to unwind the ever growing mystery of the mechanics and structure of the annual blacktip shark migration.